Movie adaptation of the memoir written by United States Navy SEAL Chris Kyle exists between the taught, tension filled investigation of The Hurt Locker and the overt rah rah jingoism of Lone Survivor. Kyle served four tours in the Iraq War and during that time, he had at least 160 confirmed kills by the Pentagon’s count, but 255 probable by his own calculation. Eastwood touches on his early years but the majority of the picture is devoted to Kyle’s military service, It is an often sobering account of how the most lethal sniper in American military history conducted his business in the Iraq War. As such it is Clint Eastwood’s best film in years. Bradley Cooper handles the role with seriousness and humility. The actor fleshes out a character with pure sincerity. Although Chris remains a bit inscrutable, his devotion to his purpose and why he does what he does, is clear. The Navy SEAL is shown to be a perceptive man who understands the severity of what he does. His actions have grave consequences. Bradley Cooper looks quite different physically here. At 6-foot-2, 230 pounds, Chris Kyle was a large guy. Bradley Cooper sports a beard and packs on 40 lbs of muscle to become the man. With her reddish brown hair and American accent, Sienna Miller is virtually unrecognizable as well in a fundamental supporting part as his wife Taya Kyle. Eastwood is effective at contrasting the difference between a sniper’s job from the troops fighting on the ground. To be honest, Kyle takes on this duty as well when he cannot be of help on the rooftops. As a sharpshooter, we are presented with the emotionally difficult decisions he must make from a distance. He weighs the importance of what he is about to do with the lasting results. Is this an innocent civilian or a dangerous enemy that threatens American lives? Not every assassin looks like a human killing machine trained for combat. Warning: the most compelling scene that illustrates this is in the trailer. The negative effects his service had on his marriage is understandable but they’re the kind of well worn issues oft dramatized. Chris Kyle is a career solider. We understand his desire to keep going back to Iraq. He has developed a reputation as a legend and he is driven to contribute to the cause. Meanwhile his growing detachment from domestic life becomes problematic. He volunteers to return for a total of four separate tours and it weighs heavily on his marriage. If there’s a mission that keeps him coming back, it is the unfinished pursuit of a Syrian marksman (Sammy Sheik) who is his counterpart on the opposite side. But his wife and kids need him too. This dilemma forms a persistent idea in the second half. American Sniper is a solid well constructed effort that is arguably Clint Eastwood’s best since Gran Torino. I would support that assertion anyway. But it’s also rather predictable. The depiction hits the familiar beats you‘d expect the bio of a dedicated solider to address. Whether the deadliest sniper in U.S. history is a hero is not even a topic up for discussion. It is just presented as fact. The reverential portrait is a tribute that honors the man. The way this affected his personal life is a key aspect. The ongoing effect that war has on an individual’s psyche as well as his family are thoughtfully addressed, but there’s never anything particularly revelatory added to the conversation. This entry was posted on November 28, 2014 at 10:19 pm and is filed under Action, Biography, Drama, War with tags 2014. You can follow any responses to this entry through the RSS 2.0 feed. You can leave a response, or trackback from your own site. Oscar nominations will be announced January 15th. American Sniper deserves to be discussed, particularly for Bradley Cooper’s physically transforming role. I would venture a Best Picture nomination is extremely unlikely though. Intriguing review… I would really like to check this one out at some point. I think Cooper has a lot of potential which may not have yet been fully realised on screen. He’s very good in American Sniper. Cooper impressed in both Silver Linings Playbook and American Hustle. He added so much to Limitless and The Place Beyond the Pines as well. The actor is in his prime right now so more great performances are still to come. Still haven’t seen Hustle, and yeah it was TPBTP which I was primarily thinking of when I wrote the comment. Fingers crossed! So jealous you’ve gotten a glimpse of this one already. Cooper in another interesting, take-charge role. Love it. And great to hear this might be a bounce-back to solid footing for Clint again. The amount of misses he’s recently been putting out is quite incredible. So many misses lately. Clint got lucky. Steven Spielberg was originally supposed to direct this. Nice review. Clint Eastwood’s been pretty hit-or-miss as of late, but I’m pretty eager to watch this, especially since Cooper’s recent string of strong performances. This is more in the “hit” category. Cooper is quite good. Yess!! I’m so excited–and again, so jealous you saw it almost two months before I will. I think I would’ve appreciated a more critical approach to its subject than the hagiography we get here. 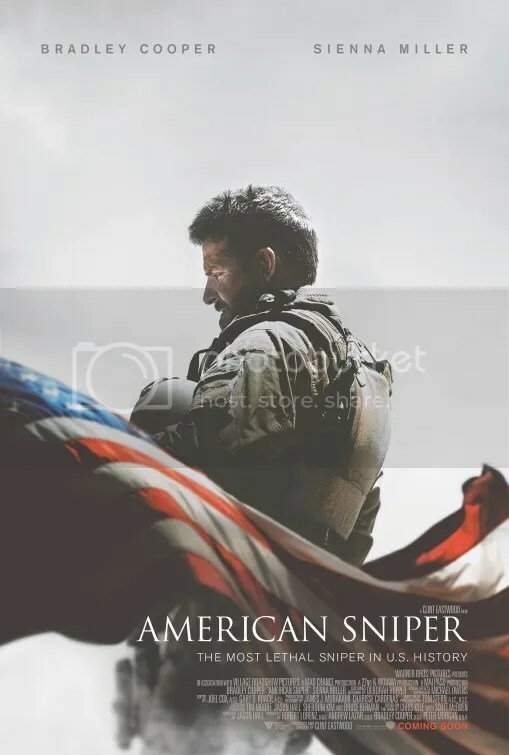 American Sniper was one that I sadly missed because it only screened on times where I was either at work or in class, but with your review included, I’ve heard a lot of great things about Cooper’s performance and about Eastwood’s direction. As someone who has felt like Eastwood’s last few efforts have been pretty lackluster, it’s encouraging to hear that American Sniper might be his best since Gran Torino. You haven’t missed it. American Sniper goes into wide release on Jan. 16. Just 2 weeks away! I’ve seen this movie advertized a lot lately. It’s certainly not anything I would enjoy (actually I read the book it was based on to get the flavor of how a person like that would think), but I wondered what you thought of it. Your review seemed a bit more positive than the 3 stars you gave it. Maybe that’s because it turned out better than you expected? American Sniper doesn’t have anything new to say but Bradley Cooper gave a nuanced performance actually. Not having read the book, I didn’t have that component to contend with. It might have affected my view of the film if I had.